What’s the best way to count loans as aid? In the close of my last post, I indicated that I had more to say about how best to count loans as aid. Now I’ll say it. They must have a grant element of at least 25% when using a discount rate of 10%. They must be “concessional in character,” which as far as I know is not defined anywhere; and this ambiguity has led to a dispute over whether a loan makes the cut if it can be expected to lose money only after factoring in the risk of default. Disbursements are counted positively, in full. Repayments are counted negatively, in full. Interest payments are not counted at all, even though they figure in the grant element. Interest receipts, you see, are income, not capital flow. Relief on a loan originally counted as ODA does not itself count as ODA, because that would be double-counting. 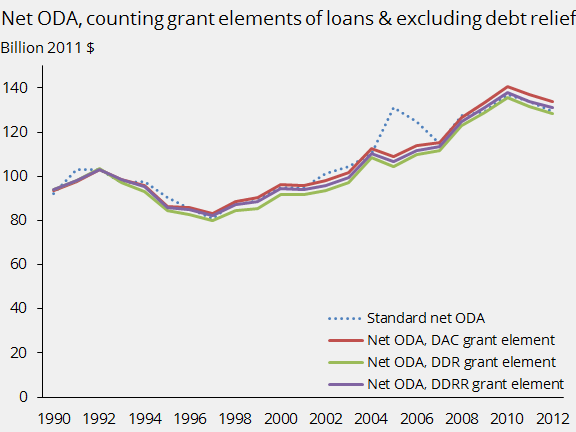 Relief on non-ODA loans does count as ODA. Somewhat bizarrely, even though interest does not count against ODA, forgiveness of interest counts in favor of it—and regardless of whether the underlying loan was ODA. Got that? In critiquing this system, a few themes arise. The first is what benchmark interest rate (discount rate) to use in assessing concessionality. I dealt with that in the last post. The fixed 10% is archaic. Differentiated discount rates (DDRs) are a reasonable system that has already won endorsement from virtually all DAC members. An intelligent case has been made that risk premia ought to be added to the DDRs to reflect the possibility of default. This would raise the benchmark rates and make it easier for a loan to count as aid. I come down against this idea, partly because it is equivalent to the proposition that the poorer and riskier a country is, the more acceptable it is to charge the country a lot of interest. That seems a hard line to defend. The second theme is whether to net interest out of net ODA. The current practice of subtracting only principal payments appears to originate in an analogy with net Foreign Direct Investment (net FDI) which includes capital flows—investment and return of capital—but not earnings on investment. More deeply, standard balance of payments accounting sharply distinguishes between the capital and current accounts. But net FDI is just a metaphor. A I’ve written before, when Ghana writes a loan payment check to Japan it matters little for the finances of either party whether the check says “interest” or “principal” in the memo field. The gain is the same for Japan, as is the cost for Ghana. So if DAC continues to handle loans by counting the flows of money as they happen, I think it should count all the money flows, including interest. The third theme is whether to filter or weight. The 25% threshold—a filter—generates some strange effects. Given two virtually identical loans with 24.99% and 25.01% grant elements, the first would be banned from “the aid Olympus in order not to mar the purity of those already present there” as Edgar Kröller of the OECD put it in 1985. The second would be 100% aid. How serious this problem is in practice, I don’t know. For the provider of the 24.99%-grant-element loan could easily tweak the terms to bring it in under the wire. Or consider this example inspired by a comment by Joachim Heidebrecht on my Guardian piece. Suppose a donor bundles a 24%-grant-element loan with a grant big enough to raise the concessionality of the package to 26%. As a package, both pieces are arguably aid. Separate, only one is. The conceptually coherent alternative to filtering is weighting: to count loan transactions in proportion to their grant elements. The way to do this with minimal violence to the existing system would be to count all development loans as aid, but multiply the associated disbursements and repayments by the grant element first. So if a $10 million a loan had a 40% grant element, then its disbursements would increase aid by $4 million, while the repayments would count against aid symmetrically, again totaling $4 million rather than $10 million. Under this smooth weighting system, tiny distinctions in reality—such as between 24.99% and 25.01%—would remain tiny in aid accounting. That would make more sense to me. One interesting side-effect of weighting would be to encourage fuller reporting of development loans. Right now ones with grant elements below 25% (Other Official Finance, or OOF) are only patchily reported, and not individually disclosed in the public DAC data. But the weighting idea brings us to a fourth and deeper question—one that would actually be first on the minds of most economists (like Chang, Fernandez-Arias, and Serven in 1998). Since the grant element of a loan is its financial gift equivalent, why not just count that and drop all this tracking of individual disbursements and repayments? This would amount to a switch from accrual to cash accounting, booking the full financial consequences of a loan when it is made. This makes even more sense to me, as it does to many other observers. Reading William Hynes and Simon Scott’s history of the ODA concept, I realized that there is no grand rationale for the status quo, for counting capital flows that are associated with loans on one side of a bright concessionality line. Just counting the grant element, on the other hand, is rooted in basic economics. The last theme that arises in thinking through the DAC system is the treatment of debt relief. If default risk were factored into benchmark interest rates, then a loan to a riskier country would already have been treated as more valuable, and counting any debt relief when it actually happened would constitute double-counting. So if default risk enters the benchmark interest rate, debt relief should not count as aid. If a Carter Administration export credit to Zaire went bad in the early 1980s, and was finally written off in 2003, the transfer that occurred does not for the most part reflect 2003 development policy. It would be best, I think, to spread the cost of debt relief over the years between when the money was lent and when the loss was officially recognized. After all, countries tend to slide into financial trouble over a number of years. The U.S. and U.K. (and probably others) have systems to spread the costs that way. Laws require their public agencies to estimate likely default losses on outstanding loans and charge newly recognized increments of default risk against current budgets. If DAC cannot reach consensus on such a system for ongoing charges, it could at least retroactively adjust past aid numbers once debt relief deals are signed. This would suffice to smooth the unrealistic spikes. I have not simulated this. But I have estimated aid totals under other formula changes considered above. See the table below. The first column of the table has the standard values according to DAC: loans are filtered by whether they have at least a 25% grant element when using the 10% discount rate. The second column was also in the previous post. It shows how things change (or don’t) if DDRs replace the 10%. The third columns uses DDRs and also factors in default risk according to the method of the Export Credit Arrangement. The next triplet of columns weights instead of filters. The third triplet switches to just counting the grant element of loans as they are disbursed and never subtracting repayments. The final triplet does the same while also excluding debt relief on old non-ODA loans. Methodological details are here. One limitation in all but the first triplet is that the totals are missing loans with grant elements less than 25%. These are not considered aid today, so they’re absent from the public database. But since the missing loans would be counted at no more than 25 cents on the dollar, the effects are probably not large. Notice how small the changes are. 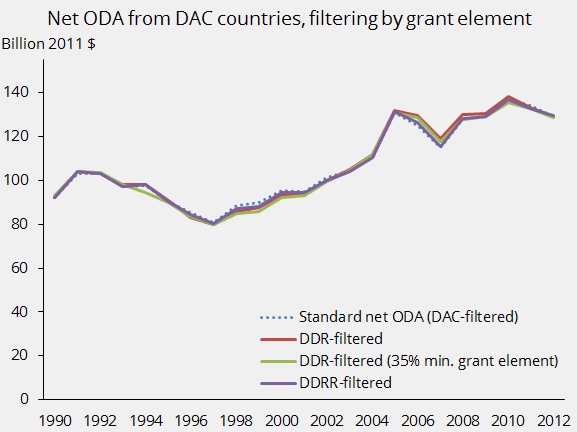 A big reason for the small changes is that most countries do little ODA lending. The result that surprised me most is how little the aid totals fall when switching from filtering (first triplet) to just counting the grant elements of loans (third triplet). I suspect this will also surprise people at Eurodad who contended that the current practice of counting loans at face value is inflating aid numbers. 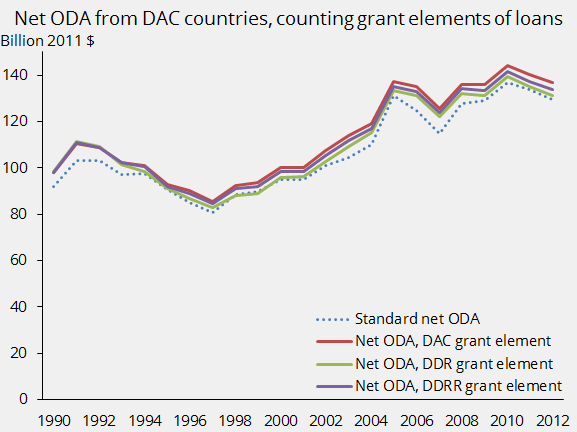 In fact, just counting grant elements increases ODA in some cases. Why? As in the switch from 10% to DDRs (explained in the last post), opposing effects are at play. On the one hand, interest payments are now counted against aid, because they reduce the grant element. On the other, principal payments are only subtracted after being discounted to the present, often quite heavily. Most of the small differences that appear in these graphs are caused by changes in the numbers for Japan and, to a lesser extent, France and Germany. 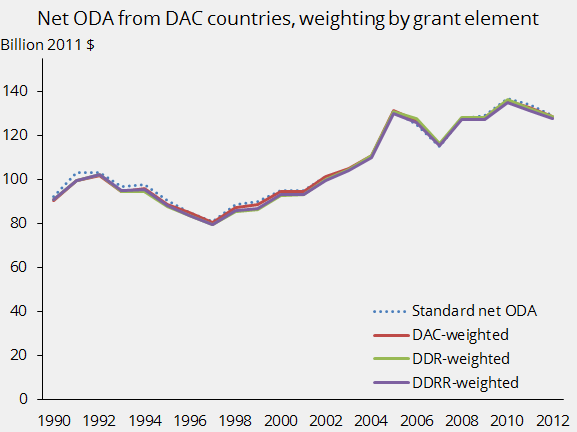 The third graph shows that just counting grant elements increases total aid from DAC countries. If we also exclude debt relief (fourth graph), the numbers come back down a bit and the 2005–06 spike caused by debt deals for Nigeria and Iraq disappears, producing a clearer long-term trend. 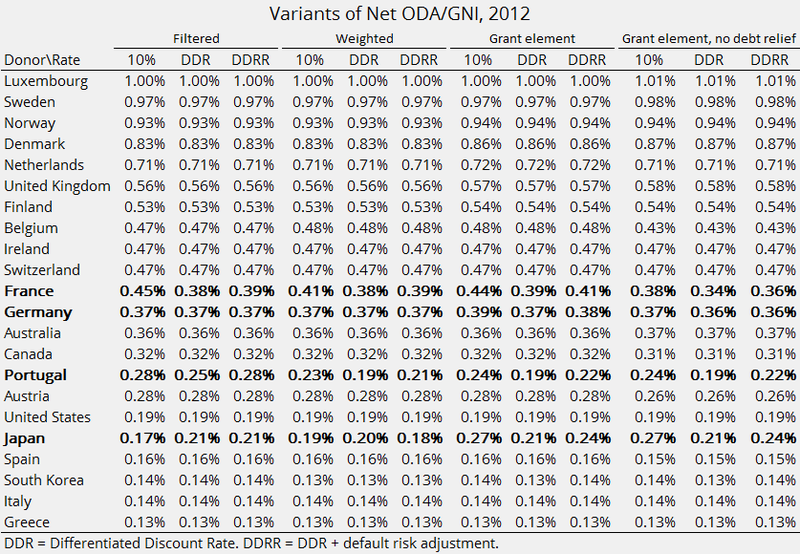 In my view the best variants are the “DDR grant element” ones in the last two sections of the table and the last two graphs. These only count the grant elements of loans, and discount using the lender’s cost of funds plus 1% for administration. I favor those not because of what is emphasized in the exhibits above—the effects on headline aid numbers—but because they create the closest alignment between the DAC reward system and the financial value of loans. Those variants should be the best at encouraging lending behavior that is financially valuable to borrowers. Yet the modest, even positive, effects of these methodological changes on most donors’ net ODA make the changes more politically realistic. 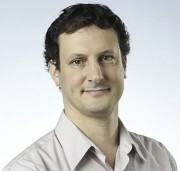 Japan, for example, would gain today under all variants modeled. It will be interesting to see how the technocratic and political deliberations play out at the DAC in the months ahead. The SQL Server database with most of these calculations is here. The table and graphs are from this Excel file.